Here’s a super simple supper that’s healthy too! Why not give this a try for a mid-week meal. Half the tomatoes and place into a bowl with the finely sliced onion, chilli, olive oil, vinegar and salt and pepper. Place a medium frying pan on a medium heat with the oil. Grate the courgette and add to a bowl along with the grated parmesan and flour. Mix together and form into golf sized balls. Flatten, then add to the frying pan. Cook until golden on each side then leave on paper towel ready for serving. Rub the whiting in flour, salt and pepper. Add more oil to the frying pan. Add the whiting skin side down and cook for 3mins. Turn over and cook through for roughly 3mins. 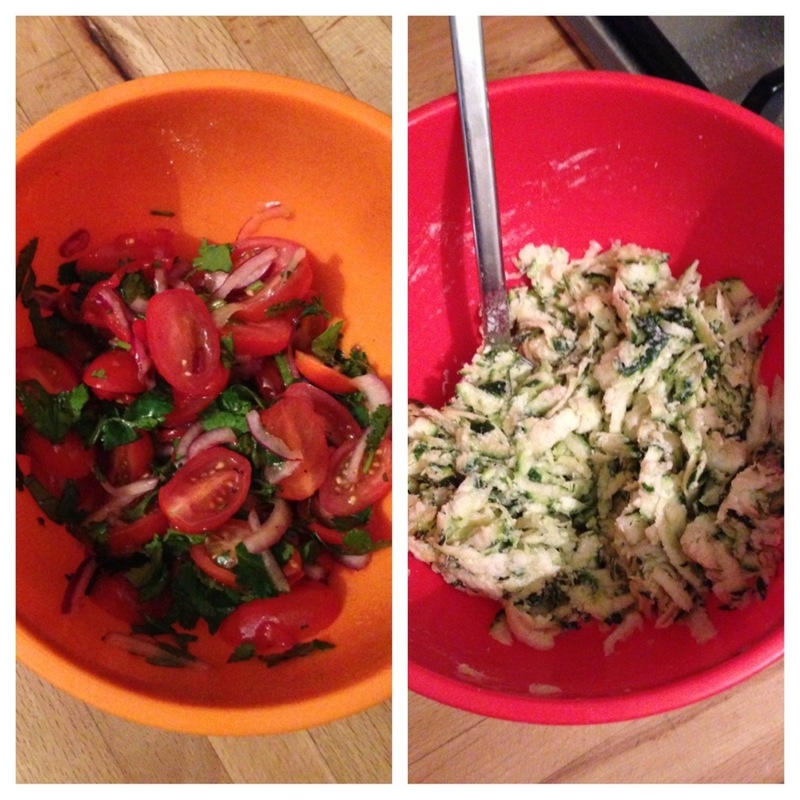 Chop the coriander and add to the tomato salad. Now simply plate up your meal. Serve with a crisp white wine. 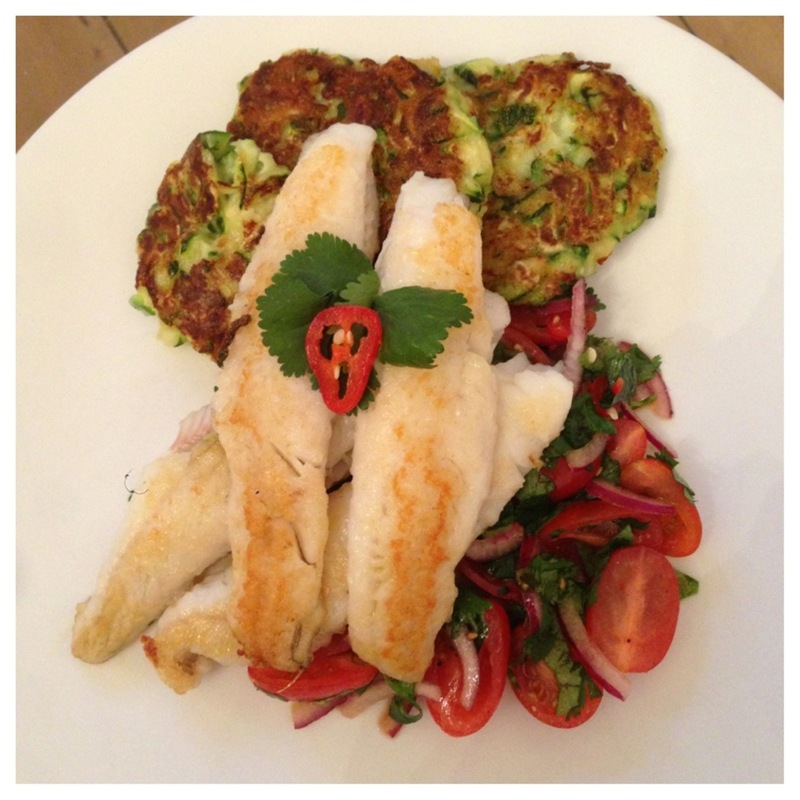 This entry was posted in Kitchen Creative and tagged Cooking, courgette, fish, fritter, recipe, salad, simple, tomato, whiting, zucchini by whysamiam. Bookmark the permalink.